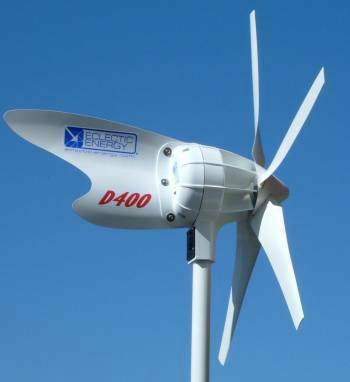 Top of the range wind generator, one of the highest output generators on the market. Specifically designed for installations on boats, on or near buildings, caravans etc. Smooth running with minimal vibration. Unparalleled low wind speed performance - outputs from 5kts of wind. Low tip speed ratio, 1.1mtr diameter rotor. Advanced variable camber airfoil blades. Robustly engineered for long trouble free service. Highly efficient, low speed, 3-phase axial field permanent magnet alternotor. Excellent heat dissipation with heavy duty encapsulated windings for sustained high output operation. This innovative machine is extremely efficient in low wind speeds, yet is capable of sustained high power outputs of up to 500 watts in higher winds. Distinctive and elegant in design, the D400 is superbly engineered for long, trouble-free service, and is available in either 12 , 24 or 48 volt variant. 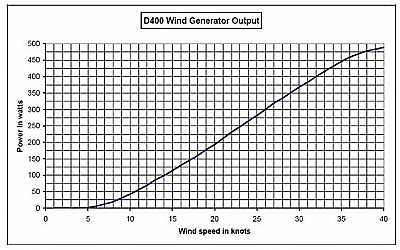 Link to youTube video of D400 running in 15kts of wind- almost silent rotation of blades. Video was taken at the Southampton Boat Show 2010 on an Ovni 395 aluminium yacht we have fitted the electronics to. We recommend fitting a regulator with any wind generator, the 12V or 24V, AND 48V regulators suitable for the D400 are shown on this website. Suitable load resistor and switch to slow unit down also available.